The Mirrorgram iPhone app creates customized mirror images of your photos with simple, smart navigation and fantastic gesture controls. This free download can easily add interest to interior design, as well as your social network profiles, blogs, and websites. The Mirrorgram iPhone app’s tools and features are available for you to shoot a photo with the in-app camera, or you can grant access to your iPhone libraries to play with an existing photo. Both function extremely well, but the interface for shooting a photo is an interesting and unusual experience. So, I would definitely advise that you take advantage of this cool process. When you are looking through the camera, you drag your finger in any direction to create a mirror image. It is extremely cool to use deft, agile gesture controls to literally pan the screen and create a fresh perspective. You touch the red icon to snap the photo. If you simply choose a photo from your camera roll, you miss all of this fun. The next screen gives you a chance to further customize your photo and apply filters. You can pinch and expand your image with gesture controls. You can adjust the light with a touch like Instagram. The coolest customization feature is controlled by the Mirrorgram icon. The icon has a darker and lighter blue criss-crossing it. The direction of the mirror applied to your photo is determined by tapping the icon with your finger. The photo instantly shifts to reflect the change in filter from angled towards the right to horizontal to vertical. You can also apply nine filters with typical variances in light and texture. The Mirrorgram iPhone app has two additional filters available for in-app purchase at $.99 each. In-app purchases for photo filters are not typically appealing to me, as they aren’t usually unique enough to warrant the charge. However, the two selections offered by Mirrorgram are fantastic. The Toon Filter amplifies the texture and saturates the color in a bold, modern, and exciting way. The 8 Bit Filter converts your mirrored photos to pixels with texture created by the richly colored pixels. 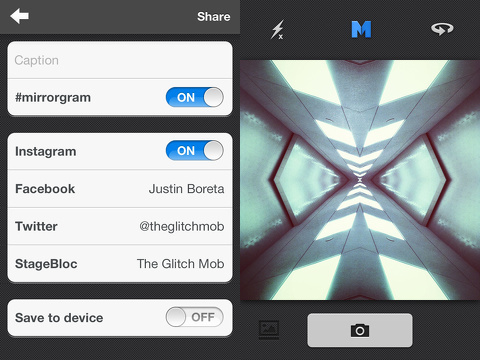 You can share your Mirrorgram iPhone photo through its no frills, yet effective sharing menu. You simply enter your caption, and you can share with Instagram, Twitter, and Facebook. You can also save to your iPhone. Simply put, the Mirrorgram iPhone app is awesome, and your Mirrorgram iPhone photo will receive lots of awesome feedback. AppSafari review of Mirrorgram was written by Jenni Ward on November 14th, 2012 and categorized under App Store, Featured, Free, Photos, Social. Page viewed 5947 times, 1 so far today. Need help on using these apps? Please read the Help Page.